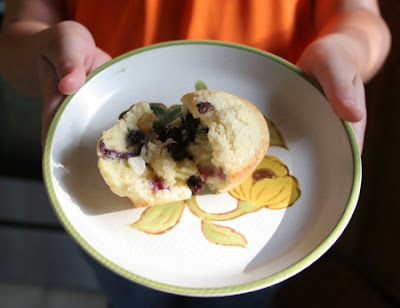 cardigans and kids: basic (and yum) muffin recipe. basic (and yum) muffin recipe. Luke has been requesting muffins since the week school started. Finally this morning I pulled out my handy-dandy "everyday food recipe index 2003-2008" and found the recipe I knew I had somewhere, just where... I wish I had all the magazines, however, I didn't discover "everyday food" until the sugar cookies in 2006 (May maybe?) I'm so glad I hung on to them. 1. Preheat oven to 375 F. Butter and flour a standard 12 cup muffin tin, tapping out the excess flour. 2. In a small bowl, whisk together butter, eggs, milk and vanilla. Set aside. In a large bowl whisk together the dry ingredients; make a well in the center. Add wet mixture to the well. Using a rubber spatula, gently stir ingredients just until batter is moistened (do not over mix; a few lumps are fine). About half way through stirring it together, add in your mix-ins. 3. Spoon batter into prepared muffin tins, filling each about two-thirds full. Bake until a toothpick inserted in center of a muffin comes out clean. About 15-20 minutes. Loosen muffins and remove them/tip them out from muffin tin and onto a cooling rack. Muffins are best the day of, but can freeze for up to three months. To freeze, after the muffins have completely cooled, place in a resealable, freezer plastic bag. Another possibility to help with prep. Combine the dry ingredients, and keep in a resealable freezer plastic bag (1 quart) in the freezer. I would label so you know if it is a single or double batch in case you prepare for a larger baking session.